This PDF 1.5 document has been generated by Microsoft® Office Word 2007, and has been sent on pdf-archive.com on 29/04/2016 at 08:22, from IP address 182.64.x.x. The current document download page has been viewed 687 times. File size: 271 KB (7 pages). 1. Taxes simultaneously ration and finance government goods and services. 2. The federal government finances only half of its expenditures with taxes. should be linked to the benefits received from those goods and services. same amount of taxes over a given period. 5. A flat-rate income tax is a proportional tax on an income base. 7. The marginal tax rate for a payroll tax is 7 percent on all wages up to $60,000 per year. 8. Tax evasion would be less of a problem if tax rates were lowered. 9. The user charge for a congestible public good should be zero at all times. 10. Zero prices for price-excludable government services provide benefits only to the poor. 11. The gasoline tax is an example of a general tax on consumption. 12. For a proportional tax, the marginal tax rate is always equal to the average tax rate. 13. Tax avoidance is an illegal activity in the United States. 14. An increase in marginal tax rates is likely to increase tax evasion. a. taxes should be distributed according to ability to pay. b. user charges are an ideal source of finance for government goods and services. c. the progressive income tax represents the ideal way of distributing taxes among citizens. d. flat-rate taxes are always the best kind. a. vertical equity will also be achieved. b. individuals of equal economic capacity will pay equal taxes. c. a flat-rate tax will be used. d. the tax system will not result in losses in efficiency in markets. b. a tax with a regressive rate structure. c. levied on an income base. 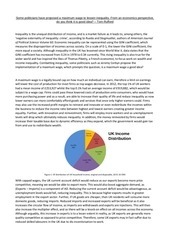 a. selective tax on wealth. b. general tax on wealth. c. general tax on income. d. selective tax on income. d. selective tax on wealth. a. always is less than the marginal tax rate. b. always exceeds the marginal tax rate. c. equals the marginal tax rate at first and then becomes less than the marginal tax rate. d. always equals the marginal tax rate. b. on additional users in excess of 100 per hour should be imposed. c. on all users should be imposed, if more than 100 users per hour are expected. a. the economy can operate at a point outside its production possibility curve. c. consumers will give up private goods to finance the increased government expenditures. c. the distribution of income. a. are voluntary payments to governments. b. are unlikely to affect market supply and demand. c. never affect efficiency in the allocation of resources. d. are compulsory payments associated with certain activities. c. have no effect on tax evasion. a. a means of tax evasion. b. a means of decreasing taxes paid by adjusting behavior. c. a political process explicitly for the reduction of taxation. d. a means to avoid tax owed. b. should be above 20%. c. should be below 20%. d. not able to be determined. This file has been shared by a user of PDF Archive. Document ID: 00366815.